On Dec. 15, the city had many options for the music lovers. Most of them though of classical music, especially Carnatic. Seniors T.V. Sankaranarayanan and T.N. Seshagopalan were singing at Kartik Fine Arts and Sri Parthasarathy Swami Sabha. Popular artiste Aruna Sairam was performing for the Margazhi Maha Utsavam at the Youth Hostel, Adyar. The young crowd-puller musician Abhishek Raghuram was in full flow at Narada Gana Sabha. 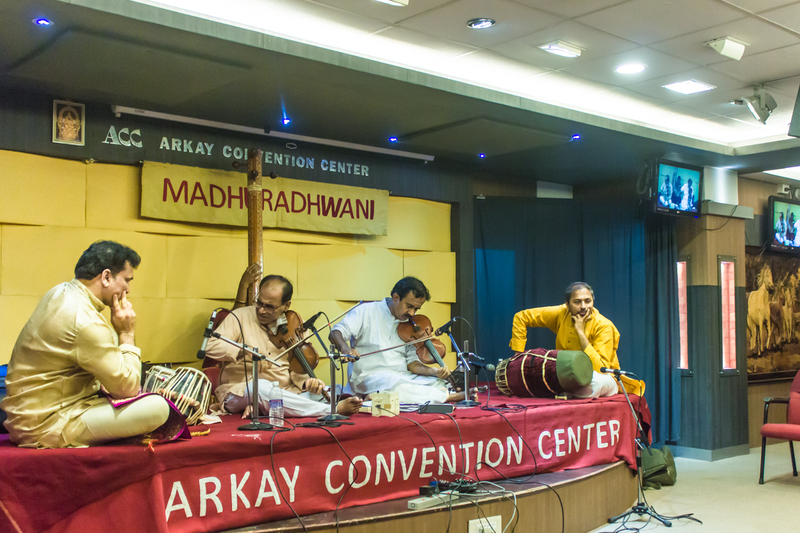 But, a hundred plus audience chose to be at the Carnatic-Hindustani jugalbandhi of violinists Lalgudi GJR Krishnan and Sriram Parasuram at the cozy Arkay Convention Centre in Mylapore. And surely they had a wonderful treat that evening. While Sriram Parasuram took the part of presenting the Hindustani style, GJR Krishnan, who stood for the Carnatic style, complimented the presentation by playing subtle phrases in Hindustani style. Both the violinists played the varnam (Garudadhwani) together as well as the tillana in Sindhubhairavi. The beautiful Andolika and its closest counterpart Gorak Kalyan was out-of-the world presentation by both the artistes. 'Sevikka vendum ayya' by Krishnan received a huge applause before Sriram began his Gorak Kalyan which got no less appreciation. Following it up with Vachaspati, which is a recent addition to the Hindustani system, Krishnan played in in the Carnatic style and Sriram presented an alap, jod, jhala. The Carnatic tanam that it similar to the jod was brilliant. The dance of Saveri and Jogia could only be experienced and not described in words. Sindhubhairavi does have a large scope for bringing out the melody in both the systems and the violinists played the tillana wonderfully well and to a standing ovation. The super-melodious percussive support by K. Arunprakash on the mridangam and Rajendra Nakod on the Tabla, enjoying each other's phrases added lustre to the whole performance. The unique concept and presentation only made the rasikas look forward to more of such evenings.